My kiddo made this experience even more fun! It was a beautiful Sunday morning. The wife and I decided to make this a non standard day. 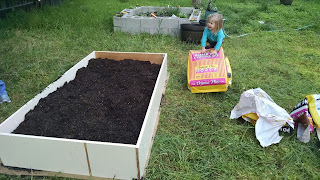 Today, we used the free wood we picked up a month or so ago to construct a garden box. The dimensions of the box were about 6' x 3' x 8", cut by a handsaw. It took 2 trips to Home Depot (we also went to Costco on one of the trips). The slide inspector is here! In the first picture, I nailed the former closet boards together, placed cardboard underneath the boards, and then we put much soil (the most expensive part) into the bed. I left two bags of soil with the top one arching off the bottom one. My little girl decided this was a very fun slide. She began sliding down and giggling. The second pictures shows the angle better. Making progress, but not quite done yet! 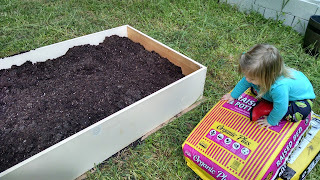 Once we had the soil in the bed, it was time to plant the transplants and seeds. This is where my wife's ability to not destroy delicate things on contact came into play, as well as her planning. The first thing we did was separate the large clump of Walla Walla onions. The roots were intertwined with each other and needed some tender loving care to help them be viable. We placed Marigolds in the corners of the box to help keep the wrong types of bugs away. Then, we put in the Zucchini and potatoes. 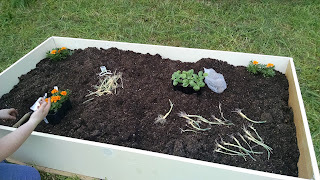 Finally, we added the carrot seeds. Once this was done, we called it a night for this box! I will post an update on this shortly.